Alcohol And Benzodiazepines Mix: Is Drinking Alcohol On Benzos Safe? Both alcohol and benzodiazepines are widely used drugs for recreational and therapeutic purposes. Unfortunately, they both have a high risk of tolerance and dependence. Each on its own has significant toxicity when abused, but unaware to most people, combining the two drugs could be even more lethal. A chronic Xanax and alcohol high can cause serious short and long term effects, not only physically but also psychologically and socially. Hence, people using benzos as well as alcohol must exercise caution and be knowledgeable about what to do in the event of severe toxicity. Unknown by many people, the dangers of combining alcohol with benzodiazepines are numerous. What are the dangers of combining alcohol with benzodiazepines? What is the statistics on benzos and ethanol use? What are the signs and symptoms someone abuses both substances? Can benzodiazepines be used for treating alcohol withdrawal? Both drugs act centrally; taking them in combination will amplify the adverse effects of both drugs. The same may be observed with alcohol and inhalant dependence. Because the drugs magnify the effects of both alcohol and benzos, combining them will easily trigger an overdose. When the CNS is depressed, breathing is compromised, and oxygen supply to vital organs diminishes. The brain cannot withstand a lack of oxygen for more than six minutes; other organs will also get damaged when they go into hypoxia. The same effect is observed when antidepressants and alcohol are combined. The other issue is clearance; both drugs are removed from the body through the liver. When a person mixes the two, the liver will take longer to eliminate the drugs which can also trigger an overdose. Both drugs cause impairment in cognitive abilities, the social drink especially. When combined, a person will have impaired cognition which will manifest as a lack of judgment and slowness in responding to critical situations. This can put them in risky and jeopardized situations. Benzodiazepine and alcohol interaction can increase the risk of heart attacks, stroke, psychosis, depression, and seizures. Chronic use will cause a gradual progression in the damage of vital organs such as the liver, kidneys, GIT and even the brain. Drinking alcohol while on Librium can cause psychological issues such as anxiety, depression, and delirium. The person abusing both drugs may end up becoming a polydrug abuser too when they are no longer able to get the relief that they are looking for from the two drugs they may seek a third or fourth alternative. Prolonged abuse of alcohol and benzodiazepines may cause physical dependence. Withdrawal from either of the drugs will be even more difficult and complicated. Ideally, benzodiazepines are used to relieve alcohol withdrawal symptoms. The withdrawal effects after stopping both drugs are more difficult to manage and can even be fatal. As the adverse effects are exaggerated when one is co abusing both drugs, a person may not be able to sustain key relationships. This will also trickle down to one’s work, roles and can greatly diminish the quality of life. According to the 2016 report by Allison Schmitz, about 5% of the US citizens have the prescription for benzos. Data from the Substance Abuse and Mental Health Administration 2014 report on benzodiazepines use revealed that about a million of emergency visits from 2005 to 2011 were related either to benzos abuse alone, or when they were combined with opioid drugs or alcohol. Moreover, the combination of the benzos with the substances mentioned above increased the risk of more severe complications (hospitalization or death instead of treatment and release) twice. About 45% of those admitted to the emergency treatment reported the everyday use of the benzodiazepine drugs during the month preceding the emergency. Alcohol was involved in 25% of benzos-related deaths in the emergency treatment rooms. Those over the age of 60 were more likely to die after the co-occurring use of the two substances. The abuse of the BZD drugs had tripled between 1998 and 2008, while the concomitant abuse of alcohol and prescription drugs had an increase of 11% in general. Approximately 20% of those abusing alcohol report the abuse of benzodiazepines as well. People abuse benzodiazepines such as valium and alcohol for a couple of reasons. For some, they start using benzos to treat anxiety caused by chronic pain and later combine it with alcohol when the pain is severe. Before they know it, they are hooked on both drugs. 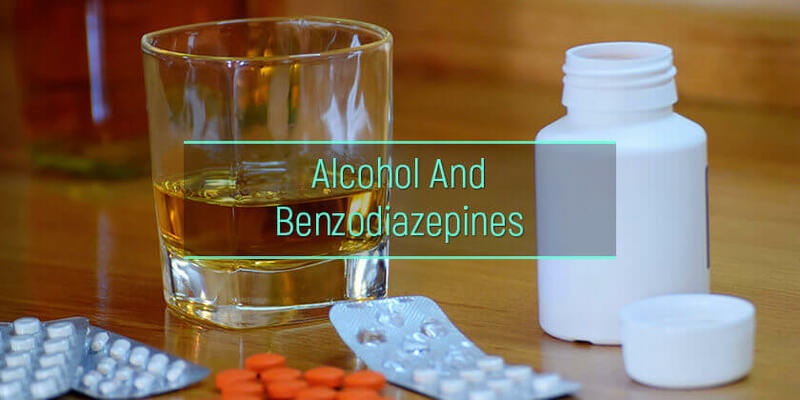 People who are using benzodiazepines to treat alcohol withdrawal symptoms may also easily find themselves in a similar predicament. While others may just do it for recreational purposes. Once they get used to the high, they may be unable to stop or taper down. The same can be said of combining POAs and alcohol. That said, how can one identify a person who is dependent on co abusing both drugs? The physical symptoms caused by valium alcohol combination as well as benzo alcohol combination are just a magnification of the adverse effects caused by each drug individually. The CNS effects leading to hypoxia may cause breathlessness, heart arrhythmias, fainting, decreased cognitive abilities, severe sedation, memory lapses, and even coma. Combining both drugs may lead to the development of psychiatric conditions such as major depression, speech impairment, anxiety and panic attacks, and bipolar related disorders. People who chronically abuse diazepam and alcohol can develop social interaction issues as they may constantly be battling severe adverse effects. Not being able to sustain meaningful relationships they may resort to being loners and even shun help from close friends. When they are unable to obtain prescriptions for benzodiazepines, they may develop antisocial behaviors such as forging prescriptions or stealing medications from other patients. It is also important to mention that sometimes clinicians who have benzos at their disposal may be more inclined to benzo and alcohol abuse. Benzodiazepines enhance the effects of the neurotransmitter gamma-aminobutyric acid (GABA) which in turn produces a relaxed state in the body through different mechanisms. Generally, they can counter the symptoms of alcohol withdrawal. As much as they have shown significant effectiveness, one should be cautious in the use of benzodiazepines as they can cause dependence over time. They also cause severe side effects when abused, more so when they are used in combination with alcohol. Thus, although these medications have a proven efficiency in the ethanol withdrawal treatment, it is highly dangerous to self-medicate oneself without medical supervision in the specialized rehab facilities. Treatment comprises of two broad approaches; medical and behavioral. But even before getting there, a person addicted to mixing benzos, such as Ativan, and alcohol must first admit to themselves that they need help. Without this, effective treatment can be very difficult. Treatment can also be complicated by underlying psychological issues that may make it difficult for the sick person to seek treatment or to adhere to a treatment schedule. This involves a detoxification process where the body is gradually weaned off the drugs. Pharmaceutical drugs are used to treat withdrawal symptoms. This process has to be carried out by qualified medical practitioners in a certified detox facility. This involves the use of non-pharmacotherapeutic approaches to treat the concomitant addiction to benzos such Librium and Alcohol.